Hi, I am interested in your 1939 Chevrolet Other Chevrolet Models (stock #3900-CHA) listed on Autotrader for $39,995. I'd like to get more information about this vehicle and confirm its availability. Theres just something about the handsome lines of a pre-war business coupe that make great custom cars. Somewhere between the flowing fenders and a moonshiner history lies an attraction that we cant help but make all our own. 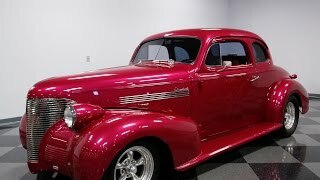 So there is an undeniable magnetism to this 1939 Chevrolet 5-window street rod that comes ready today with everything from a hot V8 under the hood, to a custom A/C interior. Streamlined and sleek, the wraparound grille and rounded fenders give this 39 Chevy a substantial, important look. Its an Art Deco masterpiece, so were happy to see the curvaceous sheet metal showing exceptional care. But you also instantly know this is far from a factory 30s machine. Its a full custom restoration that utilizes bold metallic magenta paint to make a lasting impression. But the reason why you really love this one is in the details. Youll take time pouring over all the right elements, like the custom etched side glass, blue dot taillights, shaved bumpers , custom airbrushing on the trunklid, and so much more. The business coupe already had a forward-leaning feel to the design, and it only get amplified even further with the iconic American Racing Torq Thrust wheels in a staggered size for extra aggression. It all comes together in a total package that all lets you know someone carefully crafted this vehicles image to be unique and sporting. The magenta tweed is a great way to get a comfortable interior while also nicely coordinating with the exterior color. In true craftsman fashion, this material covers the door panels, carpeting, headliner, and is even in the trunk. We know you love all of the custom graphic designs that are integrated into the paneling. Of course the tweed also covers the seats, allowing these more comfortable later model buckets to seamlessly blend with the rest of the interior. From the moment you slip behind the Billet Specialties steering wheel you know this is a vehicle meant to be your favorite cruiser. There are great comfortable features like the AM/FM stereo mounted in the headliner and modern R134a air conditioning keeping you cool. Plus, the full set of VDO gauges, large AutoMeter tach, and Lokar shifter all let you know theres something special under the hood. A car like this is meant to show off all the details, and the engine bay is absolutely included. The built V8 has been nicely dressed with checkered flag emblems on the valve covers and air topper. These shiny components go nicely with the other polished pieces such as the alternator, brackets, master cylinder, and much more to create a custom and premium appearance. So just like the exterior and the interior, the engine bay focuses on the details to really grab attention. And beneath the style is quite a bit of substance, too. We all love Chevys 350 cubic-inch small block for power, and it only gets better with enhancements like a Holley four-barrel carburetor, MSD ignition, and rumbling dual exhaust. Its a very nice power package that really moves this classic quickly with some muscle. Plus, you have the comfort of a Mustang II style independent front suspension, automatic transmission, front disc brakes, and power steering. So now youre starting to get the picture on how versatile this custom Chevy really is. Complete with title documentation, this is a distinctive coupe thats ready for everything from your local car show to the power tour. Its versatile, comfortable, powerful, fast, and one-of-a-kind, so hurry before its gone. Call now! !